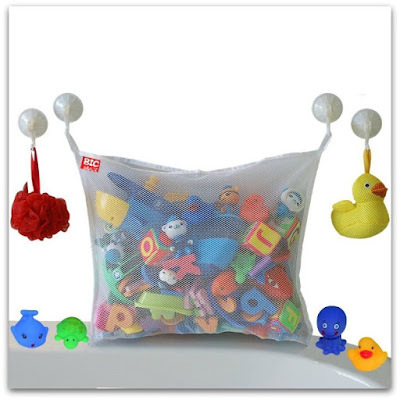 The Bath Toy Organizer by Big Mac is an excellent way to keep bath toys organized. The bag measures 18" x 14" and provides you with a lot of storage space. It's made of a strong mesh material with polyester edging for quick drying. This product is easy to set up and even easier to use. There are four strong suction cups included with this product; two are to hold the bag up and the other two are to help with organize other bath time items. The suction cups hold really well and actually have a strong suction to the wall. After getting the bag set up, I found that there are two different ways to put stuff in the bag. The two options are to leave the bag on the hooks and put stuff in it or you can take the bag off the hooks, fill it and hang it back up. The BicMax Bath Toy Organizer lists for $17.99 and is currently on sale for $12.90 on Amazon. I love this organizer and I think that it would make a fabulous baby shower gift!